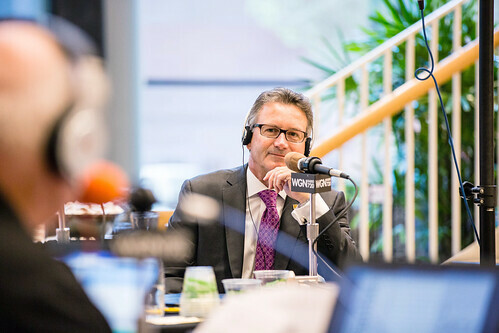 Interim President John P. Pelissero, PhD, was one of the featured Loyolans on the WGN Radio broadcast. On September 15, WGN Radio's morning and early afternoon shows broadcast live from the Schreiber Center, the new home of the Quinlan School of Business. View broadcast photos in the gallery below or on Loyola's Flickr page. The WGN Radio broadcast was part of a full day of celebrations for the Schreiber Center, Quinlan’s new home on Loyola’s downtown campus, on September 15.